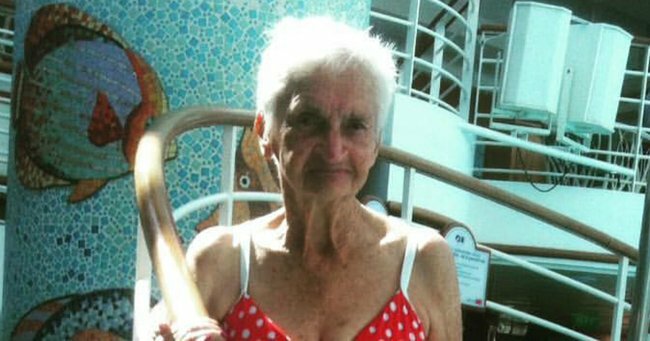 90-year-old Irene from Ballina is rocking a polkadot Seafolly bikini better than any model. One-piece or two? A simple question when you’re talking about cake (two, always two), but less so when you’re shopping for swimwear. For the more confident among us, slipping into a bikini is a no-brainer. But for others, it can take a decent dose of encouragement from a friend or loved one to bare that midriff. Thankfully, 90-year-old Irene has plenty of fabulous friends. It was friends and neighbours at her nursing home that encouraged Irene to buy a bikini, and the staff at Lady Watego Byron Bay that helped her choose that stunning polka-dot number. Ever since the store posted about Irene their Facebook page, they have been inundated by comments praising the gorgeous grandmother. Among them are words of appreciation from one of Irene&apos;s daughters, Helen. "I had the pleasure of escorting my mother Irene Kearney from Ballina on the cruise," she wrote. "Thank you to you all for all these lovely comments. I feel so proud of my mother. What an inspiration she is!" This is how the humble bikini has evolved over the years.